Former Arkansas Governor and self-proclaimed bass guitar aficionado Mike Huckabee is slamming Hillary Clinton on Election Night. The Republican has taken to Twitter to give an uncensored play-by-play of the presidential election outcome as live coverage continues. His remarks are not only careless, but they're also insulting. Is anything shocking anymore, though? Looks like someone took a page out of candidate Donald Trump's book. 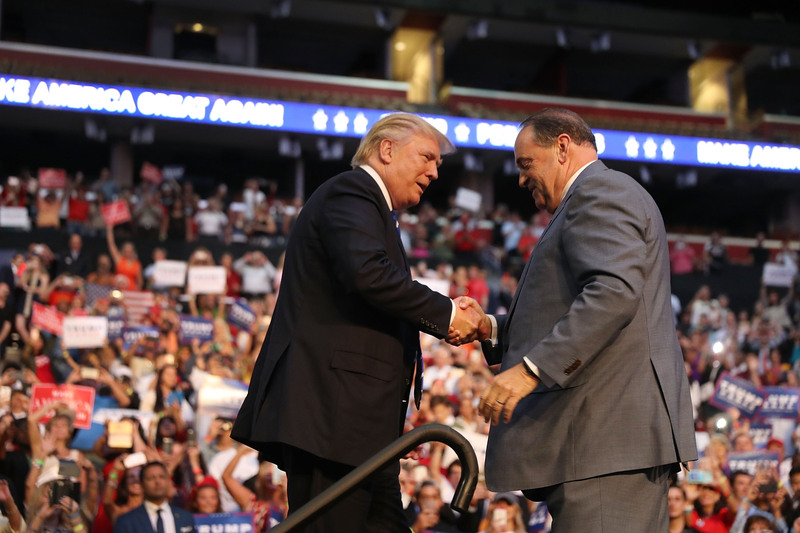 Obviously, it's expected that a public figure who's also a Republican wouldn't support Hillary Clinton, but Huckabee is full-on bashing her. Not only is he pulling the "I told you so" card as votes continue to roll in, but he's accusing Clinton of being a hypocrite and is mighty confident Trump has the election in the bag. You won't believe what he's putting out there on Twitter. Huckabee is saying Clinton will call on her "Filipino" maid, and he's mocking the glass ceiling so many women and American citizens have fought so hard to shatter. He's been flying semi under the radar until Election Night, but the former governor is currently participating in live commentary on Fox News. Luckily — well, unluckily — in case people aren't watching, he's blasting Clinton all over Twitter as well. With these messages, he not only shows complete disregard for the glass ceiling fight, but compares Clinton's loss to the bloodbath prom scene in the film Carrie. It's sheer disrespect to Clinton, women, and so many citizens of this country, but perhaps it's not very surprising. After all, before the night is through, Donald Trump might become president, and he's certainly said worse.